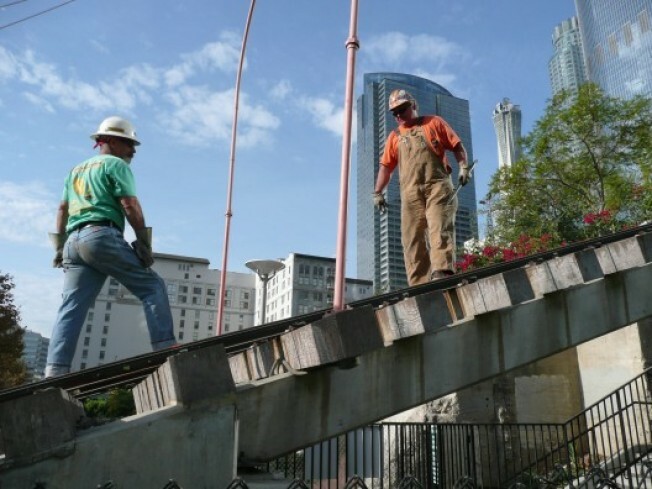 Rail work began this week on Angels Flight, that Downtown funicular that previously connected Bunker Hill to the Historic Core. A 2001 Angels Flight fatal accident closed down the ride, and there's been much speculation about when the 107-year-old funicular would open again. According to foreman Ken Johnson (pictured, wearing orange), the original two cars will be delivered this weekend and tested out on the tracks next week. As far as the official opening? "It could be Thanksgiving, but it's looking more like Christmas," he said. Work that took place this week involved refastening the clampings and redoing the rail splicings, he said. Meanwhile, John Welborne, president of Angels Flight Railway, referenced the forthcoming work this spring, stating that he "expect the contractors to return the two historic railway cars, Olivet and Sinai, to the tracks soon."